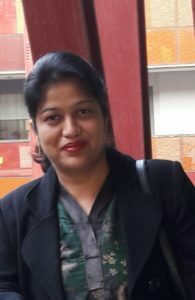 Dr. Renuka Dhyani is posted as Assistant Professor at Government Postgraduate College, Sector 1, Panchkula. She did M. Phil. on the topic “The Artist and the Community: A Study of Seamus Heaney’s Selected Poems” from Kurukshetra University, Kurukshetra in 2000. Thereafter followed Ph. D. from Panjab University, Chandigarh in 2012 on the topic “Moving Beyond Nature Writing: An Ecocritical Approach to Robert Frost’s Poetry.” Worked as a Co-investigator in a three-year Major Project of the UGC titled “Contours in American Literary Ecology: A Study of Recent American Literature and Films” (2008-2011). Particularly interested in ecological concerns addressed in literature, especially American and British poetry.